Jake’s Bar and Grill is a new restaurant in Waynesboro, opened in January of 2014. We visited for the first time last evening, and we loved it! The atmosphere was warm and friendly, with a small-town feeling that welcomed us from the moment we walked through the door. We noticed immediately that Jake’s gives a special discount to veterans and current military personnel. Upon asking, we discovered that Jake’s was inspired by Lance Corporal Jason Redifer (Jake), a 19-year old US Marine who was killed in Iraq in 2005, just two weeks prior to his scheduled return to Stuarts Draft. Jake’s death was a severe blow to his family, but as his mother stated, “You just have to keep on living.” So nine years later, Jake’s Bar and Grill opened its doors. Burgers make up the bulk of the menu, with 12 options currently available. We settled on the Tumbleweed (a half pound of beef with jalapeno poppers, crunchy fried onion strips, lettuce, and Jake’s chili pepper sauce), and the Sweet Armadillo (a half pound of beef with pineapple, bacon, cheddar, lettuce, and Jake’s cowgirl sauce). All their burgers are made from 100% natural, locally raised, USDA certified ground beef. If burgers don’t delight you, choose from a variety of other sandwiches, including a Pineapple BLT, a Southwest BBQ, and the Cowboy Andy Chicken Sandwich. 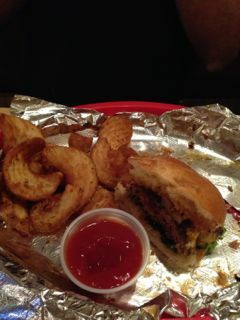 Every burger and sandwich is served with Jake’s famous Outlaw Fries. These fries are like nothing you’ve ever tasted. Thick and hearty, curled slightly, and covered in a special southwest seasoning, they are simply mouth-watering. For dessert, we ordered Jake’s Fried Cheesecake Chimichanga. All I can say is WOW! We will be back, and we highly recommend Jake’s to our vacation rental guests. It is privilege to patronize a local restaurant that honors our US military, and the ultimate sacrifice made by one man. 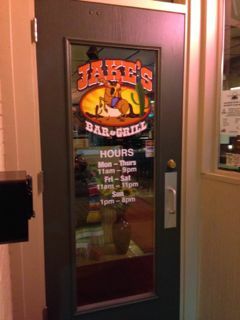 Jake’s is located at 137 North Wayne Avenue in Waynesboro, VA.